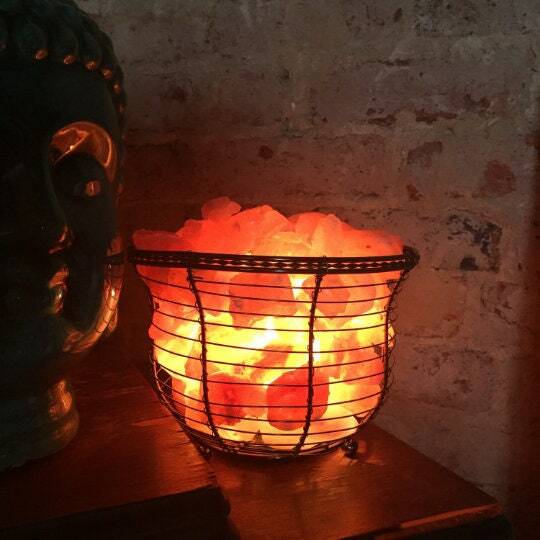 This beautiful natural Salt Basket Lamp is made with pink Himalayan Sea Salt resting in a wire basket. Lamp includes a , dimmer switch and 6-1/2 ft. electric cord. >>>Not only are these lovely and beneficial for any home or work space.. they are perfect for yoga studios, massage therapy or other holistic healing spaces. 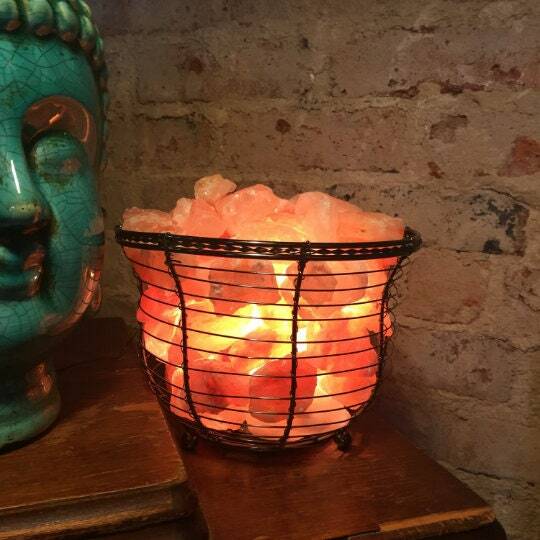 All Himalayan Salt lamp baskets come complete with a 25-Watt bulb, UL listed cord and On / Off toggle switch. Bulb sits down in wire basket surrounded by natural salt rocks. Occasionally, you may choose to wipe of salt rocks with a damp paper towel. >>>Due to the nature of the natural salt each rock in the basket will vary in color, shape & size. >>> Reduced shipping is available when ordering more than more salt lamp basket. We will give a partial refund for the shipping overage when you complete order. Weight approximately: 9 to 11 lbs. Dimensions approximately 8 in. x 8 in. x 6.75 in. >>>Please note: Each unit will come with manufacturer information inside box. I do not offer any sort of warranty, refund, or placement. If the unit arrives in non-working order, you have exactly 3 days from delivery date to contact me for a refund or replacement.